Death Valley National Park visitors enjoy wildflowers from the road. Photo courtesy of the NPS. 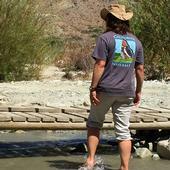 A California Naturalist explores the creek. How did we get here and where shall we venture together?